A chic place to mix and mingle, Cane Quarter is the heart of Cane Island. The contemporary architecture captures your eye, but it’s the vibe that inspires. From zen yoga sessions to outdoor concerts to s’mores at the Firepit or happy hour at the Loft, anything and everything happens here. A community highlight, this contemporary eatery serves seasonal fare, exquisite wines, and well-crafted cocktails. It’s just a short stroll from home—ideal for a post-pool lunch or an easy night on the town. Open to all, The Oaks Kitchen brings Cane Island residents and Katy locals together over delicious meals and delightful conversation. At the kid’s pool, time is marked by the sounds of a 500-gallon bucket of water spilling over—and soaking whoever stands in its way. It’s summer fun at full throttle, jumping from slide to pool to bucket. And if that’s not your thing, find shade in our cabanas and settle in for a full day. Our lap pool is a chic setting to get your strokes in. It’s a little quieter; you can go at your own pace. Head here to linger and lounge in our refined oasis. We’ve taken an elevated approach to fitness. Our yoga studio is a tranquil space to get your heart rate up. Featuring weekly yoga and barre classes, as well as spin bikes, there are so many ways to maximize your workout here. 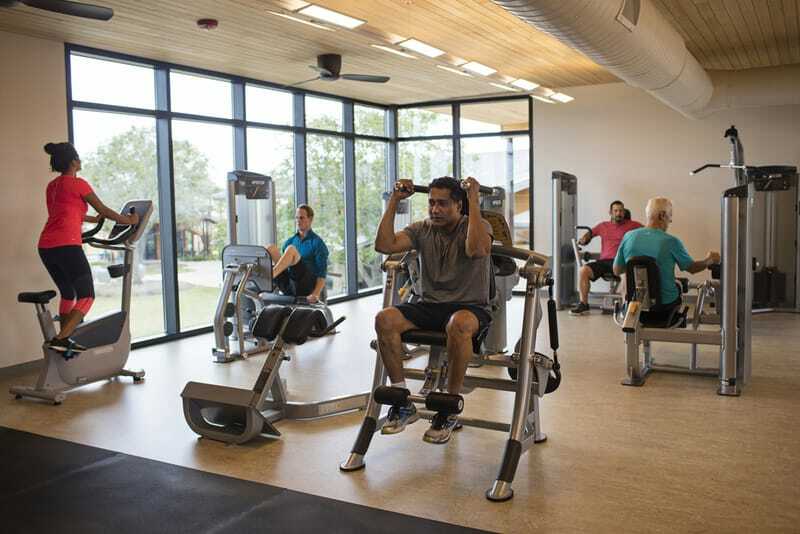 Our two-story fitness center is open 24/7, so our state-of-the-art equipment overlooking Cane Quarter is always available. With all the strength-building machines you could need, it’s the ultimate place to lift, ride, stretch and sweat. The stage is set for excitement. The summer means movie nights, while the fall brings late-night bonfires at the Firepit. Hub is always roaming about, exchanging hellos for belly rubs. There are impromptu soccer games on and at the Loft, you’ll find space to share meals and conversation. The glass walls of the Conservatory set the tone for epic gatherings, framing events to be unforgettable. From weddings to wine and cheese parties, this is the space where the contemporary surroundings and vertical gardens inspire guests and hosts alike. Available for residents to reserve, let us know if you’d be interested in having an event in this stunning location. Miles of winding trails, thoughtful parks, and picturesque waterways call to the adventurer within each and every resident. Hike, bike, play and kayak across Cane Island. Our community is a haven for those looking to amplify their time outdoors. Vibrant arches and impressive fountains let you know you’re in Cane Island. It’s an artful way to welcome you to our delightfully different community. Here, inspiration can be found around every turn. Go slowly and take in the legendary beauty. Perched high above Cane Quarter, the Ambassador Suite is a private luxury cottage. Inside this custom-built treehouse, residents experience Cane Island’s most elusive amenity. It’s available by request for an exclusive overnight getaway; send us an email to see if you could be the next guest!